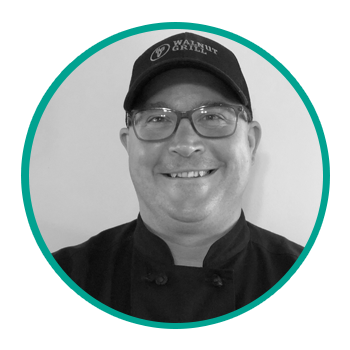 Owner Operator of Walnut Grill restaurants: Ellisville, O’Fallon, and Sunset Hills, Missouri, is Eric Vogel. Eric Vogel lives in St. Charles County with his wife Sue and their two children. Vogel opened his first Walnut Grill location in St. Louis in 2014; however, he has been in the St. Louis restaurant scene since moving here in 2000. From Romano’s Macaroni Grill in Houston, Texas, Vogel transferred to St. Louis where he oversaw Charlie Gitto’s restaurants for ten years before working as the corporate food and beverage manager for the Drury Hotels. Vogel started his culinary career attending Johnson & Wales University in Charleston, South Carolina, and Providence, Rhode Island. He has an Associate Degree in Culinary Arts and a B.S. Degree in Hotel/Restaurant Management. In addition, Eric is a United States Army veteran. Today he continues to actively support veterans and active duty personnel through charitable works via his work at Walnut Grill. Eric is also the founding member of 100+ Men Who Care St. Louis which is a charitable organization that meets four times a year to give back to local St. Louis charities.